Enough ports for your fleet of devices - all at superfast speeds. A hub that does its job well, and does more too. Don't deny your devices access to SuperSpeed ports. With transfer rates of up to 5Gbps, set aside less time for syncing and more time for work. With 4 data terminals to choose from, forget about ever having to switch or unplug again. 4 separate LED indicators reveal each port's power and transfer status, keeping things visually under your control. And, with its no-brainer driver-free installation, plug-and-play and hot-swapping, actually using it really couldn't be easier. Usage Alert for Power Users. • To ensure a stable connection, the connected devices must not exceed a combined current of 3.4A. This is especially important for any devices with high power requirements such as "self-powered" hard drives which draw power from the USB port. We recommend that you avoid simultaneously connecting four or more of such "self-powered" devices. • This hub is not designed to serve as a standalone charger and will not charge an iPad tablet or any other device with non-standard charge requirements. • Some USB 3.0 devices require a direct connection to host USB 3.0 ports, including some USB 3.0 hard disks and SuperDrive. • 2.4Ghz wireless devices (keyboards, mice, etc.) may not work around USB 3.0 ports. 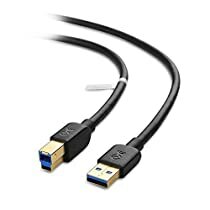 Try using a USB 2.0 connection. SuperSpeed USB 3.0 ports support data transfer rates of up to 5Gbps. (The actual transfer rate will depend on the capability of your device). Backward compatible with USB 2.0 / 1.1. Solid port construction and industrial-grade material endure years of use. 4 blue LED indicators indicate the power and USB connection status. Power button for manual control. Built-in surge protection, a high-grade chipset and a 24W adapter guarantee stable operation. Plug-and-play. Supports hot swapping. No install driver needed. 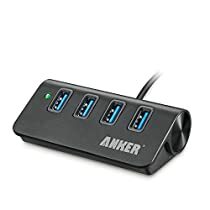 Package includes: Anker USB 3.0 4-port Hub, 3.9ft 12V 2A power adapter, 3 ft USB 3.0 cable, user manual. Free lifetime technical support and 18-month manufacturer's warranty. You can tell that this item isn't made with the best materials because it's light and feels a little flimsy, but honestly, so what? It works very well and doesn't look bad on the desk when you take care of cable management. I used Velcro to fasten mine down and it makes it feel sturdy and solid. I also taped the cords down in tracks so that they are organized. The one real downside I see to this is that the power cord is pretty short. I have mine about the middle of my desk and the cord barely makes it down the back of the desk to the floor. I'd say give it a shot, probably there's a really small chance that you'll get a defective one. Most people who write reviews are the ones that had problems. There's probably an infinite number more who were fully satisfied so that had no reason to go back and write a review. Keep that in mind. The adapter works with 220V so if you're not from the US, you don't have to worry about that. This design makes pulling tiny USB sticks out effortless. However this affects how tightly held the devices are. Short USB sticks won't wobble, but longer ones like my Asus Wifi adapter will. Not enough wobble to bend or break the USB though, so no worries here. 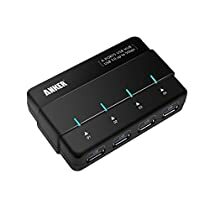 Before buying this one, I had my eyes on the Anker 13 ports hub which runs 12V 5A. The reason why I went with this one is because you technically get more output of each slot since this is 12V 2A for 4 ports. And also for the fact that you connect your USBs horizontally, whereas the 13 ports hub is vertical. This USB 3.0 hub works perfectly. Love the individual blue indicator LEDs; they help you know when something connects or disconnects properly, and they aren't terribly bright, either (which, for me, is a good thing. My last hub had a blue LED light also, but it blinded you if you stared at it too long. lol). Didn't have to wait long at all for my Surface Pro 4 to recognize the hub, and there is no lag time at all when I connect or disconnect devices. Also, because of the supplied AC adapter, I find that it doesn't drain any of my Surface's battery. It isn't as small as other hubs I've seen, but it is still highly portable, and with a power adapter stronger than other hubs I researched, you can guarantee your devices are getting the power they need. (I also don't need to carry a hub with me for the most part since my Surface has a USB 3.0 when I need it and bluetooth technology otherwise.) Best of all, once you turn off your computer, the LED indicators turn off, even though your device is still plugged into power. Again, my last hub, since it was powered through an AC adapter, would always leave the light on. It was annoying to say the least, but this one is perfect.) Oh, and I really like the longer cable it comes with (as well as the fact that the cable is detachable for better storage and if it breaks later on down the road). P.S. : Contrary to one review I read, I haven't noticed the hub or any of my devices get too hot due to the adapter.